No matter what type of noise problem you are dealing with at home, there are some great soundproofing products on the market that can give you the peaceful relief that you’ve been looking for all this time. The truth is that there are a lot of different types of soundproofing materials, and some are better for certain products than others. For instance, if you’re looking to a build a home recording studio then you might need different soundproofing items than someone who is looking to soundproof a ceiling with noisy upstairs neighbors. Here at Audio Smarter, we’ve gone through all the products currently available on the market and come up with a list of the top 10 best soundproofing materials for any home and any type of project. So, whether you’re looking to soundproof a room or the entire house, you should be able to find products that meet your needs from this list below. If you need some cheap soundproofing solutions, then a good multipurpose mineral wool insulation like this one from Roxul is a great choice. It can be used on both exterior and interior walls because it has some thermal insulation capacities. It is very easy to find in home improvement stores and online. And, installing this soundproofing insulation is very easy since it is so flexible, even if you have no prior experience. This product is the perfect way to finish off a soundproofing project. 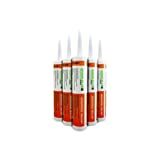 It is designed for use as a sealant for cracks where noise can leak through. Place where you will use this include floors, ceilings and walls – basically anywhere you find a crack where noise might sneak its way into your home. Using this reduces noise leakage by up to 100 times. Just pop it into a caulking gun and you’re ready to go. And, once it dries you can even paint over it if you want it to match the color of the wall or ceiling. Made the same company as the product listed above, this one is ideal for those low frequency sounds that have been annoying everyone in the house. It is designed for use on floors, ceiling and walls. 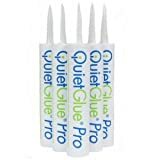 Use a regular caulking gun to apply it as an extra layer of sound dampening material. And, it is much easier to install than mass loaded vinyl. I find that this material works best if you add another layer of drywall and put this in between the two layers. 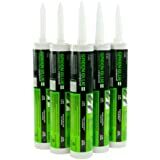 Similar to the Green Glue Noiseproofing Compound above, this sealant focuses on sound dampening. 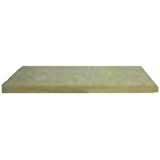 It is best used in the same manner – by apply it between two sheets of drywall for extra sound absorbing action. This actually a great soundproofing product for home movie theater rooms. It is also easy to use and apply as all you need is a standard caulking gun. And it normally has a similar price to the Green Glue alternative. When it comes to cheap soundproofing materials, this is probably your best bet right here. Not only are these things cheap, but they are also super easy to install. And, they are the perfect soundproofing solution for renters as well as for home recording studios. 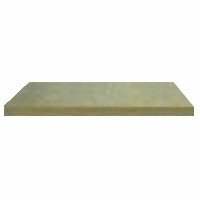 If you need some cheap ways to soundproof a ceiling, then foam acoustic panels are an easy and inexpensive way to take care of that. 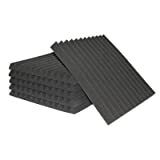 These foam soundproofing panels are very effective at blocking out high and mid-range frequencies. And probably the best thing about these is that can be installed a variety of different ways. So, if you want them to be temporary, you can just use double-sided tape or pins, or you can do a more permanent type of installation. Noise blocking curtains are another great way for renters to soundproof an apartment. 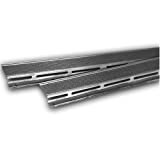 These are also perfect for thin pane windows where you experience a lot of road noise. In fact, I used some of these to soundproof my bedroom for better sleep quality at night. 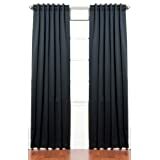 If you have a home movie theater room, acoustic curtains like these are a great way to control the rooms acoustics for the optimal theater sound experience. 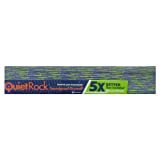 Resilient channels might not look like they have much to offer in terms of soundproofing, but they are actually quite effective at it. They are sheet metal rails that you mount across the ceiling joists and wall studs. You put these over the top of the insulation and actually attach the drywall to them when hanging it. The way that these work is that channels absorb the sound waves so that you are not disturbed or annoyed by them. I think it goes without saying that soundproof drywall is going to give you better results that your standard drywall. That make leave you wondering what the difference really is between the two. Soundproof drywall like QuietRock has greater density and mass, which means that it is better at sound blocking that regular drywall. Of course, it is not cheap. In fact, it costs a bit more than regular drywall, so it might not fit in your home budget. This is the very best when it comes to high performance soundproof insulation. However, it can only be used for interior walls, ceilings and floors because it has zero thermal insulation capabilities. It is also very affordable, however it can be difficult to find in local stores and online.